I get enthusiastic about comics anthologies for the same reason I enjoy attending fringe-y theatre and film festivals. There’s something magical about being able to immerse oneself in a range of stories and styles in one place. In that setting, I find myself more willing to step out of my comfort zone and try something new – perhaps a piece of experimental movement-based theatre, maybe a foreign-language film from a country about which I know very little. And whether it’s a volume of short stories or a tribute album of covers(I feel like I was just talking about how much I love a good cover version), if the first bit doesn’t resonate, it won’t be long before you’re on to the next part, which may speak to you in a way you mightn’t’ve anticipated. Beyond that, when there’s a confluence of that much creative energy, regardless of medium, you just know it’s going to turn into some kind of a party. When people are all in it for the right reasons, it really does become a celebration. And not an awkward I-only-know-the-birthday-girl-and-she’s-busy-because-it’s-her-birthday party. It’s the perfect mix of just enough friendly, familiar faces in attendance and an atmosphere conducive to lots of introductions being made among kindred spirits. The sort of shindig you’ll leave knowing more cool people than you did when you arrived. Occasionally, there’s a festival or anthology of works that are all of a particular type, share a tone, or are centred on a specific theme and I know, right away, that I need to dig in. 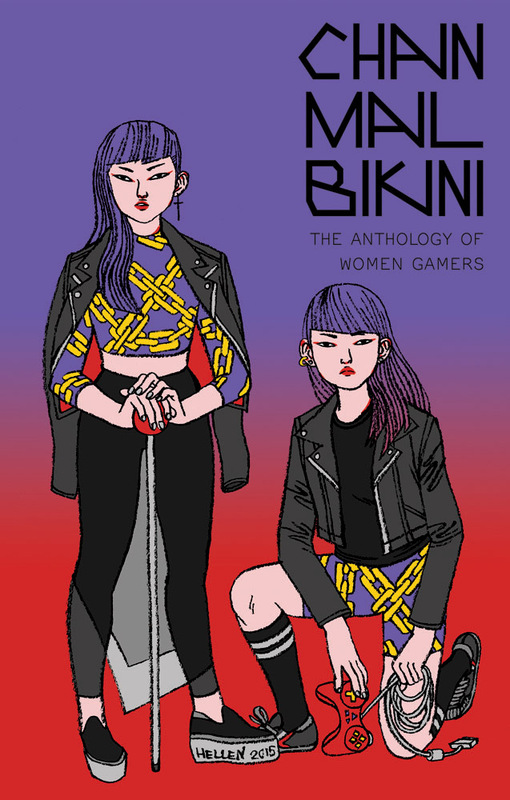 Late last year, I first heard about Chainmail Bikini, an anthology of comics by and about female gamers. My mind flashed back to a number of monologues by Manda Whitney that were part of a production I directed entitled Headshots and Healing Potions. The one-woman scripts focused on video games and they grabbed my attention. I was hearing stories and opinions that just don’t get enough air time. Unlike a finite theatre run, the beauty of comics is that they’ll wait for you to find them and to let them blow your mind. When I got a chance to peruse a preview copy of Chainmail Bikini, it did just that. The impressive breadth of content in the anthology is delightfully balanced by its editor, Hazel Newlevant, who is also one of its contributors. By bringing together players of collectible card games, tabletop games, video games, and LARPs, Chainmail Bikini prompts a subtle Hornby-esque shift of a reader’s focus from “what gamers like” to “what gamers are like” and puts all the stories in the collection on common ground. As such, your favourites on your first pass might need to make way for new favourites during your second time through the book. On its pages, you’ll find moving autobiographical vignettes, quirky musings, heartwarming reflections, and every permutation thereof. I anticipated enjoying the submissions of Sara Goetter, the creator of the wonderfully whimsical webcomic Boozle whose comic Haircut was included among my favourites from 2014, and Molly Ostertag, the artist responsible for Strong Female Protagonist – another webcomic I recommend highly. I certainly was not disappointed by their contributions, but the one story that, if you’ll excuse a musical pun, struck a real chord with me was by Elizabeth Simins. It’s a piece about OCD and Guitar Hero 2 and what it achieves with its deceptive minimalism left me in awe. And those three entries are just the tip of the iceberg. The work of forty cartoonists takes the publication’s page count over two hundred. Like a well-designed game, Chainmail Bikini sets forth a straightforward premise and then challenges as it delights, capturing your imagination and before you know it, you’ll find yourself invested in it. Speaking of investing, the anthology is being produced and published with the help of a Kickstarter campaign that is happening right now. Generally, I seek out crowdfunding initiatives that involve some sort of swag beyond the actual item I’m funding, but I admire that the only stretch goals listed for Chainmail Bikini are a single tier of improvement of the book followed by target amounts that will increase the payments to all of the artists who put their time, energy, and talent into this high-quality product up-front. For more information about Chainmail Bikini and/or to pre-order the book Click Here.